The media landscape is evolving at a rapid pace and with $223.7 billion dollars in media advertising last year and a projected $240 billion this year – there is no sign of slowing down! In order to stay relevant publishers are not the only ones that need to evolve alongside the industry, so too do the technology companies delivering solutions that impact and/or touch the advertising workflow. Key to evolving is understanding all the pieces on the chess board, how they can benefit you, what moves can they make, what intelligence can they deliver in terms of strategy, and ultimately how can they help you successfully navigate the board and/or conquer the competition. The good news is there is an incredible amount of data available to media companies that provides robust analytics and expanded intelligence to help make smarter business decisions. The bad news is there is an incredible amount of data available to media companies. Knowing which data, you have access to, how it ties together with other data sources, and ultimately how can it help you advance your business can be a full-time job. Staying ahead of the data curve is something I am passionate about, as we at Matrix pride ourselves on being able to connect disparate data sources in the ad workflow to deliver media companies automated intelligence that positively impacts their bottom line. We get that change is our new normal which is why we have continued to evolve our ad sales platform, Monarch, alongside the industry’s transformation, anticipating what our customers and prospects will need all while staying hyper focused on where we can add value to their operation. The companies who wait for change are often left behind. Monday April 8th the Alliance for Women in Media will host a Women’s Room breakfast event, open to all, during the NAB Show. The event will feature an exclusive panel that dives head first into the changing media landscape. Key discussion points will include traditional vs. non-traditional media and what does that even mean, the changing consumer behavior, data and business intelligence’s role, and how can we prepare for rapid transformation. I am honored be a part of AWM, (I was recently elected to the Board of Directors), but I am even more honored to be a part of this event focused on industry transformation – and prouder that Matrix Solutions is a sponsor! We, as an industry must change if we want to move the needle when it comes to embracing the future of media advertising. 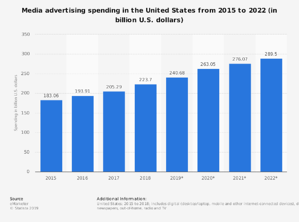 After all, in 2022 media advertising is anticipated to climb to $289.5 billion – that is 30% growth from 2018! The best news? There is still time to register to attend, AWM’s Women’s Room event April 8th from 7:45 – 9AM at Westgate.